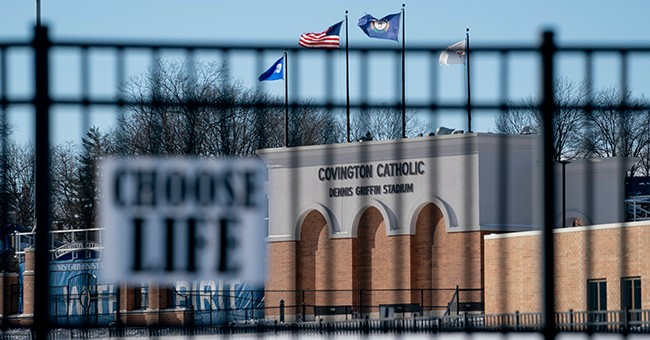 A Covington High School mother is speaking out about the viral video clip depicting an encounter between a group of pro-life teen boys, and a Native American activist. On Tuesday’s “Fox and Friends,” Jill Hamlin described what initially lead up to the confrontation. She explained that the teens from the all-boys’ Catholic school in Kentucky had attended the March for Life, as they do every year, and found themselves being verbally attacked at the Lincoln Memorial by a group called the Black Hebrew Israelites. Hamlin, who served as a chaperone on the trip, believes the boys were targeted for their beliefs, and because they were wearing “Make America Great Again” hats. “I think they were targeted for what they stood for... which is Christianity, the right for life, and they were singled out and I believe partially because of the color of their skin they were targeted,” Hamlin said. When the initial video of the incident was released Saturday--on a Twitter account which has since been suspended--it appeared to show the teen boys mocking a Native American man, Nathan Phillips. Though the boys were widely condemned across social media, extended footage of the encounter released later revealed that theywere the ones being harrassed. According to Hamlin, before the boys ever encountered the Native American activists, they were accosted by the Black Hebrew Israelites. The group was “screaming horrible, horrible things that I will not repeat” at the students after the march, Hamlin said. Phillips has given varying versions of the events. He first told the Washington Post that the teen boys approached him from out of nowhere, but later claimed he was intervening between them and another group. In the interview, Hamlin also criticized the local diocese and school for making rash judgements about the boys and for threatening an investigation that could end in expulsion. Hamlin’s interview is available to watch here.